All this week, watch The Big Bang Theory weeknights for the Key Word Of The Day and a chance to win the Ready Player One Sweepstakes. Text it to 46373 or go to BigBangWeeknights.com to enter. You could win a hometown advanced screening of Ready Player One, a virtual reality system, $1,000 cash and Ready Player One merchandise. You could also win $1,000 a day through April 6.
Who Can Enter? 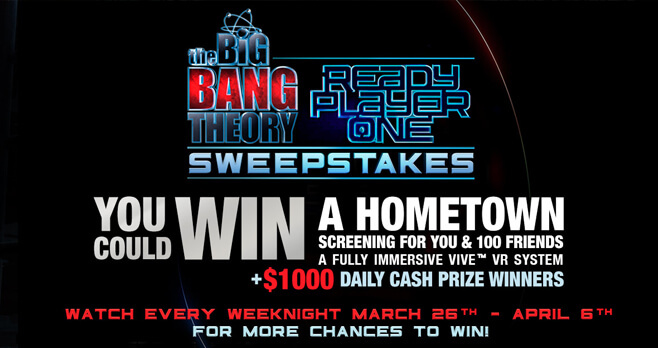 The Big Bang Theory Weeknights Ready Player One Sweepstakes is open only to individuals who are 18 years of age (or age of majority in their jurisdiction of residence) or older, who are a legal resident of and physically residing in one of the 50 United States or the District of Columbia (excluding Puerto Rico, Guam, American Samoa, United States territories, possessions, and protectorates, foreign based United States military installations and wherever restricted or prohibited by law). When To Enter? Sweepstakes begins Monday, March 26, 2018, at 12:00:01 a.m. PT and ends at 11:59:59 p.m. PT on Friday, April 6, 2018.